Where appreciation for creativity is the only requirement. Michelle Millar Fisher is the Louis C. Madeira IV Assistant Curator of European Decorative Arts and Design at the Philadelphia Museum of Art. From 2014 to 2018 she was a Curatorial Assistant at the Museum of Modern Art, New York, where she co-organized, amongst others, the exhibitions Design and Violence, This Is for Everyone: Design Experiments for the Common Good, From the Collection, 1960-1969 and, most recently, the 2017 exhibition Items: Is Fashion Modern? and the accompanying catalogue. The recipient of an MA and an M.Phil in Art History from the University of Glasgow, Scotland, she is currently completing her doctorate in architectural history at The Graduate Center at the City University of New York (CUNY). Michelle and I were colleagues at MoMA in the Architecture and Design Department, and share an interest in the intersections of gender and design. I talked with Michelle about what it means to be a curator today, the challenges of highlighting diverse work in a field notorious for its lack of diversity, the mentors who have inspired her, and some of the unique design stories she has uncovered along the way. Arièle How did you become a curator? You studied Art History. Did you know back then you wanted to work in a museum? Michelle I went to school to study English and Scottish Literature at Glasgow University—but the art history classes ended up being the ones where I found great teachers who supported and mentored me. My first museum job was as a security guard at The Hunterian looking after the geological exhibits. I then applied to about 14 different internships at museums in the United States, but didn’t get in anywhere. At the very last minute, someone dropped out of the Guggenheim summer internships and they invited me for a three-month position in museum education. It wasn’t curatorial work, but it was a real job at a museum and I had never been to New York before. I tried to make myself indispensable. At the end of the internship I said, “Can you give me a job?” In retrospect it was quite forward, but they did! They gave me a visa and a job! A From that first job in education, how did you make the leap into curatorial work? M My first love was teaching, and I loved being in museum education at the Guggenheim. I’m the first generation in my family to graduate high school, so I know how important it is to have access to institutions of knowledge. But I quickly observed that within the museum, there was a hierarchy — with curators at the top. I still don’t agree with that, but I realized that in order to have agency, especially as a woman, I wanted to be in the place that would give me the most control and the ability to redistribute that power. I applied maybe three or four more times to the Curatorial Assistant job at MoMA before I finally got it. A There seems to be a lack of awareness that design and architecture can be shown in a museum—or that being a curator of architecture is even a profession. How did you become interested in curating design and architecture specifically, rather than art? M People are affected on a daily basis by architecture and design. In a way, it can be more approachable than thinking about art. There is an immediacy to talking to people about the buildings they interface with on a daily basis and revealing a toolkit they can use to understand their own place within the structures that frame their lives. A I’m interested in two of the items you helped bring into the MoMA collection in your time there: the Rainbow Flag and the View-master, which is the first work from an African American designer that we acquired for the Architecture and Design collection. Can you speak to those, and why featuring diverse designers is important? Paola brought the @ sign into the museum collection in 2010—and couple of years ago when we were working on an exhibition about symbols and icons for the Hyundai Card Design Library in Seoul, South Korea, I thought it would be interesting to have more of these in the collection. As I was researching I became interested in vexillology, which is the study of flag-making, and the signs and symbols that appear on traditional heraldry. I came across Gilbert Baker, the designer of the Rainbow Flag, and realized that his design history had not really been told. on a daily basis by architecture and design. In a way, it can be more approachable than thinking about art." There is a real lack of diversity in the MoMA architecture and design collection, of women and non-white men. The statistics are fairly dismal, and they’re repeated across many departments and many other museum collections. Doing research on African American designers, I found that Charles Harrison had been awarded the 2008 National Design Award from the Cooper Hewitt. There was no good reason why MoMA, as a premier collection of architecture and design, had not acquired his work. The View-master is such an iconic work of design. Everybody knows it! Curators are interested in architecture and design because it touches everyone—and our collections should be reflective of everyone’s experience. No museum can do everything, represent the whole world; that is not logistically, or financially, or even conceptually possible. However, we live in a country where the black experience is a profound aspect of our history, and a major element of the national identity. There are many black architects and designers whose work we could be showcasing. If our collection is not going to represent them and their histories, then we are not doing the job of a modern and contemporary architecture and design collection based in the United States. A In major museum institutions, that history of exclusion is so pervasive. It’s continued to leave a lot of people out of a shared understanding of what “good design” is, what “good architecture” is. In response to our current political moment, do you think curators, artists, designers, have a political responsibility? "It’s always interesting to look not only at what we have in our collection, but what we don’t have, and why." M Hugely. I think you have to be politically aware, and I feel like most of us come into this field because we are. Increasingly, I’ve been questioning whether I can continue in this field as a curator and a teacher in institutions where the power balance is totally asymmetrical from the get-go. Just the fact that you have to pay money to get into the museum is a huge barrier to entry. Beyond amazing public programs and exhibitions, we actually need to be doing more in terms of challenging the asymmetries of the politics of the institutions we work in—the HR departments that we work under—and really take them to task. Everything else we do is worthless if we’re continuing to feed those beasts. A We’ve talked about diversity in collecting works of architecture and design, but what about when it comes to the curators themselves: are you concerned about the state of our profession and the lack of diversity and representation in the curatorial world? M I often think of the Ruth Bader Ginsburg quote: “‘I’m sometimes asked, ‘When will there be enough women on the Supreme Court?’ and I say, 'When there are nine'.” At MoMA, Ann Temkin is the only woman chief curator! That’s insane. That’s a travesty. And I cannot say in strong enough terms: that’s not ok. We have to think about intersectionality in the museum’s hiring practices to create a system where you are attracting more diverse staff and creating pathways to grow professions over a period of time, over a lifetime. 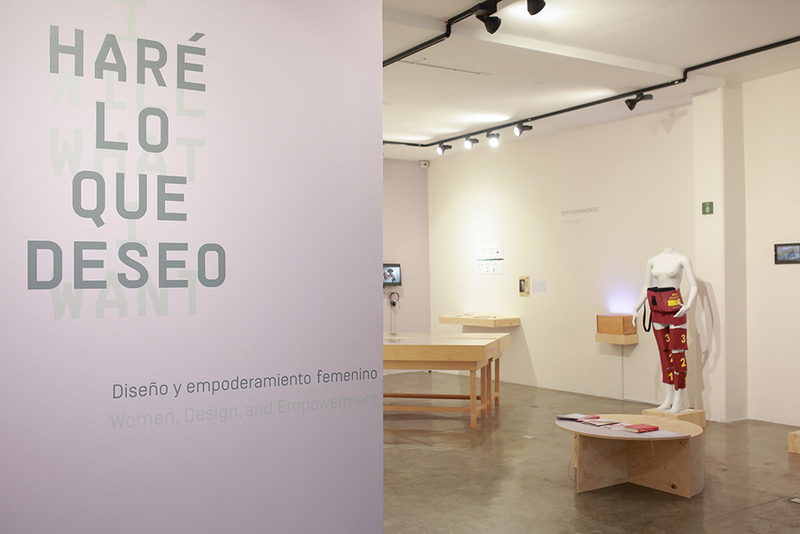 A You recently curated the exhibition “I Will What I Want: Women, Design, and Empowerment” with Jimena Acosta (link). The exhibition was on view in New York at the Parsons School of Design in April 2017, then traveled to MUCA Roma in Mexico City, and you have a catalogue forthcoming. Can you give us an example of one of the design objects that was in the show? M I absolutely love the home pregnancy test. When the technology for pregnancy tests was first developed in the mid-twentieth century, you had to go see a doctor in order to take it. It would take a couple of weeks before you would get the results so, for a couple of weeks, you didn’t know what was happening with your body. You couldn’t make decisions about the pregnancy. In the late 60s/early 70s, a young graphic designer, Margaret Crane, thought to package the pregnancy test in a format where you could give it to women in their own homes, and designed the first home pregnancy testing kit. Any kind of design where women, or those who identify as women, are involved in taking greater agency over their own bodies and their own choices is just incredible, and should be part of the conversations around what product and industrial design is. A At MoMA, one of your last projects was the exhibition “Items: Is Fashion Modern?” What was it like delving into the world of fashion history, and what does it mean to look at fashion through the lens of design? M It was definitely a team effort: fashion historian Stephanie Kramer, Anna Burkhardt, Kristina Parsons, Paola and myself, and many others. We were looking at everything from the late 40s/early 50s Dior dress to Spanx, which is now part of the legacy of inventions in twenty-first century fashion. It’s always interesting to look not only at what we have in our collection, but what we don’t have, and why. In 1944 there was the brilliant exhibition “Are Clothes Modern?” by Bernard Rudofsky, but afterwards there was a moratorium on fashion because it was seen as ephemeral and feminine. Fashion was not part of the same conversations around product design, industrial design, graphic design—which is indicative of the types of people who were making decisions. A Who are the contemporary designers whose work you are excited about now? M My favourite designers are Revital Cohen and Tuur Van Balen. I just love their work, because it marries extraordinary aesthetics with the political, and represents an incredible awareness of the world. I’m always excited to see whatever they do next. I also love the work of Kerby Jean-Raymond, the fashion designer and founder of the menswear label Pyer Moss. His last New York fashion week show was just unbelievable. He took it to a next-level place. A What are you reading right now? M Alvin Toffler’s Future Shoc* is on my bedside table right now. I had never read it before. It’s fascinating and terrifying.